Matching your film to the items you’ll most often be wrapping helps optimize your packaging experience. There are many varieties of film on the market. While they’re largely interchangeable, specific tasks or specific products may require specific film. The smaller the gauge number of the film, the thinner the film. For most general applications, 75 gauge will suffice. In applications where strength is of particular concern, large baskets, heavy and bulky multi-packs etc., you'll want to consider 100 gauge film. There are two types of film that predominate, Polyolefin and PVC. All the polyolefins we carry are FDA-approved for direct contact for food. Not all PVC is, so please check! Most films you see are 40-40's. That is, they shrink 40% in each direction...exerting pressure on the package as you shrink it. Most items from baskets to cd's can be wrapped with this type film. If you need to wrap a softer, less rigid item, the pressure will cause it to warp and/or ripple if you wrap it with traditional shrinkwrap. To wrap this type of item there is limited shrink films, 10-10's. They only shrink approximately 25% compared to typical shrinks. This exerts much less pressure on your packages making it suitable for soft, pliable items like mouse pads, magazines, photos etc. Limited shrink is available in both Polyolefin and PVC. There are special films available for specific applications. SSXP40, for example, stops shrinking as soon as it encounters resistance. *Please contact us if you are unsure as to what film would work best for your specific application. We also sell Cut-bands or bandseals. Cut-bands are small, easily applied inexpensive "rings" of shrink film made from PVC tubing. Used to secure caps and lids on jars, bottles and tins, like the security seal on a bottle of aspirin, they can often solve packaging issues at a remarkably low price. Also available pre-formed for bundling. Our traditional PVC is FDA approved for indirect food contact. Choose traditional PVC to prevent color bleed and smells escaping, making it especially suitable for wrapping bath bombs and fizzies, and soaps, where you don't want the scent to pass through the film. This industry favorite is great for CD's, DVDs, VHS, candles and to overwrap most packages on a variety of machines or equipment. This is particularly good for wrapping gift baskets and trays. 100 gauge for big basket and trays or 75 gauge for smaller baskets and trays. It is beautifully clear and is crisp enough to wrap a basket with a spray of film on top like wrapping a basket with cello. The difference being that you can clearly see what is in the basket as opposed to trying to look through the folds of cello to try to figure out what is in the basket. We stock 75 and 100 gauges in centerfold and 100 gauge in tubular. Tubular works really well with very large baskets because the two sides are folded so you just have to seal the bottom. Polyolefin is a very strong, puncture-resistant shrink film that's FDA approved for direct food contact. It has a matte finish, clear, very soft and flexable, yields to pressure, resists breakage and allows scents and smells to come through. It is very effective for wrapping irregularly-shaped items and items with sharp edges or corners. Polyolefin is softer than PVC, feels like a plastic bag, and because it's acid-free, makes it especially suited for matted prints, artwork, photos, cards, scrapbooking and all paper products. If you plan on bundling or multi-packing you might want to consider it as well. We stock polyolefin in 60, 75 and 100 gauges. For an extravagant look for your baskets and gift sets, we have holiday and all occasion-themed films. They are all 100 gauge and tubular for a secure package and all are FDA approved for direct contact with food. Check for pricing and availability. Prints currently available include Gold Stars, White Confetti, Hearts & Strings, 4 styles of Xmas Wraps and more! Set yourself apart from the rest of the retail crowd! For flat items, add the longer of the length or width to the height and add 2”. That will be the width of the roll you need. Our systems are available in 9”, 15”, 20”, 25” and 30” lengths. 40” by special order. Get the system that just exceeds the width of your film requirements. If your items are small, like a deck of cards, soap, cd’s, DVD’s, Cosmetics and perfumes, pads, etc etc... you can arrange them in a grid, and seal 12 items for the effort it would normally take to do three pieces with a larger system. The film you use will ultimately be determined by what you typically wrap. 2. For the correct height, measure the basket all the way around from top to bottom, add 10% and divide by 2. Round up to the next even number. This will give you the correct height of bag....which on the roll, is the measured width. Get it? In other words, you measure the height of the basket to determine the width of the film you'll use. If you want a “spray” or "swoosh" of film coming from the top of the basket, add 4-6”depending on overall height. Our bag sizes are all listed, width by height. 3. If you ever wrap numbers of the same sized baskets, you might consider tubular film. Tubular film is configured like a pillowcase, open at both ends. Your baskets wrap even more securely, mostly due to the absence of seams on either side. 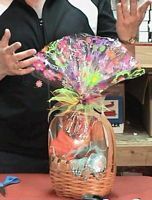 Absolute easiest way to wrap baskets in the "cello" style, with a spray of film rising from the top or coming out of the side. The difference between using shrink or cello is that with PVC you can shrink the bottom part of the basket while leaving the top "un-shrunk". You then get the flair of a cello wrap, with the notable difference being that you can actually see what's inside the basket when it's wrapped with PVC and with cello you can only guess at what lies within, trying to peek through the folds.